Gonna try doing misleading Buzzfeed-style headlines like the above from now on. Enjoy that. Since 1989, the world has been following the heartbreaking journey of the Lonely Whale. For reasons unknown, he or she cannot speak the same language as other whales. Referred to by some as the 52-Hz Whale—because of its unique frequency of whale song—the Lonely Whale has been tracked roaming the oceans alone, listening in vain for a song that will never be returned. 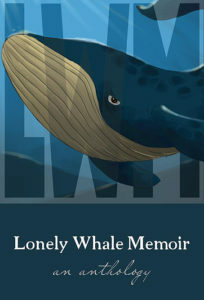 The Lonely Whale Memoir gives voice to the unheard song within all of us, capturing themes and feelings sparked by the actual Lonely Whale. Through compelling stories and passionate poetry we will swim past the isolation that normally separates us and, for a moment, truly connect. I just finished reading my copy of the book last night, and I highly recommend it. A lot of great stories and poems in there; among them, there’s one called “Neighborhood Watch” by a Courtney Bird that’s worth the price of admission alone, I think. Looks like you can purchase a copy from Amazon, or straight from the publisher. Get your whale on.